The Legendary Edition of Blood Bowl 2 has been announced at Le What's Next de Focus, our press event in February 2017. We're pleased to finally unveil all the info about this new edition! PC/Mac, PlayStation 4 and Xbox One. For new players: the Legendary Edition with ALL the content of Blood Bowl 2 at the price of a full game. Contains BB2 base game + Team Pack (Wood Elf/Lizardmen/Nurgle/Norse/Necromantic/Undead/Chaos Dwarfs/Khemri) + Official Expansion. For existing owners of BB2: the Official Expansion content. All info about preorder on Steam are HERE. Full compatibility between the 2 versions. Most small features and quality of life changes will be available to all BB2 players, even those who didn't purchase the Official Expansion. No lasting SPP/injuries between each round. Choose a race and get unlimited gold, as well as the option to add any skill/stat/injury. These teams get a tag “custom team” which can be banned from a league. Our goal with the combo “team editor + resurrection mode + Swiss system” is to give players the opportunity to experience the rules played on tabletop. You have a map where you can go from a competition to another. Less cinematics/story and more freedom. Teams composed of players picked from different races. Several groups of teams you can pick your players from (i.e. “Elf team” = Pro Elf, WE, HE, DE). These teams will also have a specific tag – they won’t be allowed in Champion Ladder for example. Teams composed of 16 Starplayers. These teams will have a specific tag as well. Accessible by all coaches with a team registered in the league. You can discuss with your opponent even after the end of the game, as long as you stay on the “end of the match” screen. Possibility to play a league with a mix of human players and AI teams. The AI will take the current turn of the game into account (and not cross the pitch with dwarfs at turn 16). It’s been discussed a lot with the community – more skills will be optional (Pass, Dodge, Tackle, Fend, Tentacles, Break Tackle). Save during a singleplayer match. Option to deactivate ageing in solo. 3 pauses per player per game. No time limit to a pause. Any player can unpause at any time during a pause (even 5 seconds after a player paused). Players can use the chat during the pause. New cheerleader models (not one per team, but a bit more diversity). Cheerleaders will have the same colors as the team they're supporting. Option to display the tooltip in dice probability (“2+” instead of “83%”). We aim at 50 Starplayers total. They won't all have a "premium skin" but we want to make them all available gameplay-wise. Option to ban players from a competition in-game. A lot of other small things – mainly “quality of life” improvements. 95% of the content of the Legendary Edition is directly taken from your feedback and suggestions about Blood Bowl 2 since launch. Thanks for being this commited and enthusiastic towards Blood Bowl! A few screenshots to ease your wait - the bear is the big guy for Kislev! We just posted 3 new screenshots of the Vampires, Goblins and Elven Union teams! Pro Elves (or whatever they're called now) look too much like BB1 imo. Something feels off about them compared to the general BB2 aesthetic. Vampires look evil, cunning, powerful, threatening and arrogant. So pretty much perfect. Only question is how they still have eyes without shades on? The Goblin Troll looks even goofier, so that's good as well. The biggest news revealed in these screenshots however is that we're not only getting new cheerleaders, but new stadium crowds as well! The human overpopulation has been dealt with apparently. Pretty nice! Yeah maybe pro elves look a bit "off", but vamps and gobbos are amazing. Oh lordy, I am having a hard time containing myself! That papa smurf looking troll is AMAZING! Pro Elves look great, I was kinda worried they'd not not stand out enough Vs existing elven teams but I was worried over nothing. Others look great too - vampires look less camp (based on Lord Luthor and Jim our blood thirty commentator) and instead look properly menacing and Goblins? Well who doesn't love the gobbos with Fanatics to Pogoers they're easily the most requested team we were waiting on anyway. Nice spot about the crowds, didn't notice at first but that's an extra feature I was not expecting but will really add to the immersion. Well played, the wait for the screenshots was worth it! 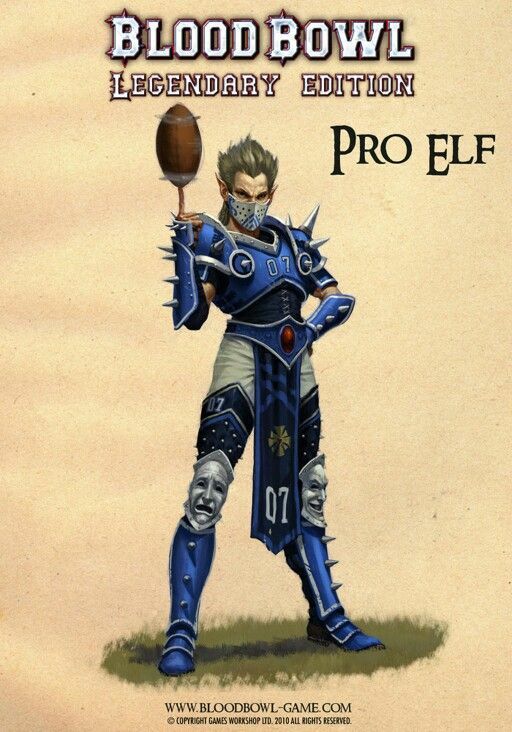 Pro elves are my favorite team and they look decent, just hope they will have plenty of head options. Some mohawks and more harlequin color schemes as well with diamond/checker patterns etc. Also unsure if I like where the team logo/icon is placed on them. They are supposed to take from the old cyber elf aesthetic. The armor looks a tad crude compared to these though...moreso in the shoulderpads than anything. Wow, all the three new teams look AMAZING!! I can't wait for "late summer" (aka, winter). Full cutscene on Facebook and Twitter. @Netheos Is that animation final? The touchdown as the start looks very dynamic but the dance afterwards makes the bear look like an automaton, instead of an actual living animal. @Netheos Well, that's quite nice. Whose heart wouldn't melt for some polar bear dancing? And the Ogres in the audience go wild! Never expected the bear to literally do a dance celebration lol. Fair to say the Kishev will be oozing character and can't wait to see more of their animations in action (they are a circus team with "long legs" aplenty so their gonna be very acrobatic). Brilliant news, I was thinking of going into cyrostatis and just thaw me at release!!!! Are any new stadium inducements planned?? an ambulance that gives another apoth or igor to either team would be good!!!! Will the stadium, sponsors and enhancements get a revision? Or is this something that you hold back for Blood Bowl 2 Chaos Edition? The Amazons and Ogres are warming up, a dangerous time for Gnoblars!